I realized today that somehow I had the comments off feature in my post about the Chicago Half and 5k. Not sure how that happened but I fixed it and you can now comment on that post. I did not keep up with my training while in Alaska. I tried. It was hard. I will post a few pictures from my trip here but will include more in separate posts. I’ve created a page specifically for this trip. I left Wednesday morning to begin my trip to Alaska. First stop was Seattle where I shared two flights with my nephew. The next stop was Anchorage. That evening there was a 5k. It was fun! The next day was a trip to Seward. This is a view from the train ride. I saw a moose, a bear, and a couple of eagles. Finally in Seward and before boarding the ship. It was beautiful and cold at Hubbard Glacier. Our first stop was Juneau where I ran a half marathon for state #38. Ever been on a cruise? Where did you go? I’m linking up with Holly and Tricia for their Weekly Wrap. 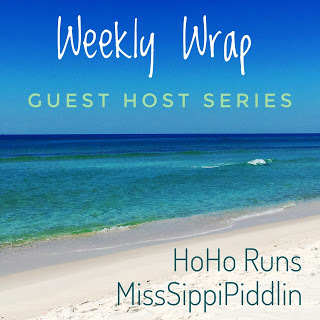 This week’s host is Deborah at Confessions of a Mother Runner. Please stop by her blog and show her some love! I am also linking up with Courtney for her Training Recap Link Up! The race was part of the cruise. I wasn’t going to go all the way to Alaska unless I could run a race there. You are almost done with your states! Can you believe it? What a great trip and I enjoyed following your IG posts. I can hardly believe it myself. It is taking me longer than I thought but all that matters is that I get it done. Wow state #38?! That’s awesome! Alaska is definitely on my must see list. I’ve never been to Alaska or on a cruise (whomp whomp). BOTH are on my bucket list! Both were so much fun! Definitely do it. I have never been on a cruise, but I would LOVE to do one someday! Your Alaska trip looks like it was a blast. I’m sure it’s a different world up there! This is my second one and hopefully don’t wait too long to go on my next one. It is very different in Alaska. So much greenery (??) and clean air. Training while on vacation is so tough for me too–it’s my biggest weakness. I do try to find races to run on vacation, because otherwise I can’t guarantee I’ll get those runs in! Alaska is one of my very favorite places I’ve visited. Glad you got to enjoy it! OMG! I was determined to get all of my runs in while on vacation. I did a cruise with family around the Baltic Sea when I was in college. The summer nights were quite light, and I woke up one morning around 2:30 and thought it was time to go down to breakfast. Oops. Haha. I would have done the same thing. But wow cannot imagine it being so light at that time. I found it so weird in Anchorage being so light at 9:30 that night. That trip to Alaska sounds and looks amazing!! It’s hard to keep up with workouts during vacation… it’s hard enough keeping up with them while at home! Thanks! I was determined to do all of my workouts while on vacation. 🙁 Well, at least I had fun and that’s important too, right? What amazing sights!! Alaska is definitely on my bucket list, I’d love to run a race up there, I hope you had a great time! I haven’t been on a cruise in a few years…now I’m tempted! Thanks! It is beautiful there. Many times I found myself just staring out and enjoying the view. Beautiful photos! What an amazing trip that was. Sure was! Now I am trying to remember all of it so I can write about it. It’s hard to keep up with training while on vacation! Your trip to Alaska looks great! I want to go there some time! So awesome you ran a half marathon there! AHHHHHH!!! That looks so beautiful 🙂 Alaska is on my bucket list. I can’t wait to hear how the race was. The glaciers are so pretty and didn’t you love feeling nippy air!! Thanks Karen! It was GORGEOUS and BEAUTIFUL!! !